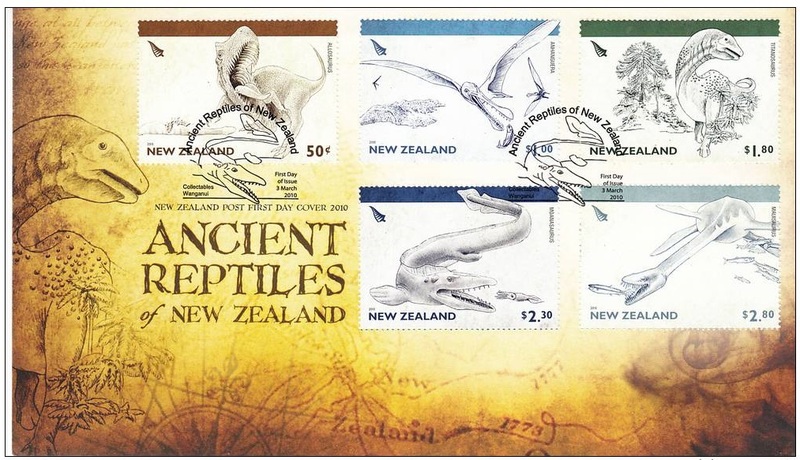 In 2010 New Zealand Post celebrated our incredible extinct natural heritage with an issue of five oversized stamps and five amazing coins. 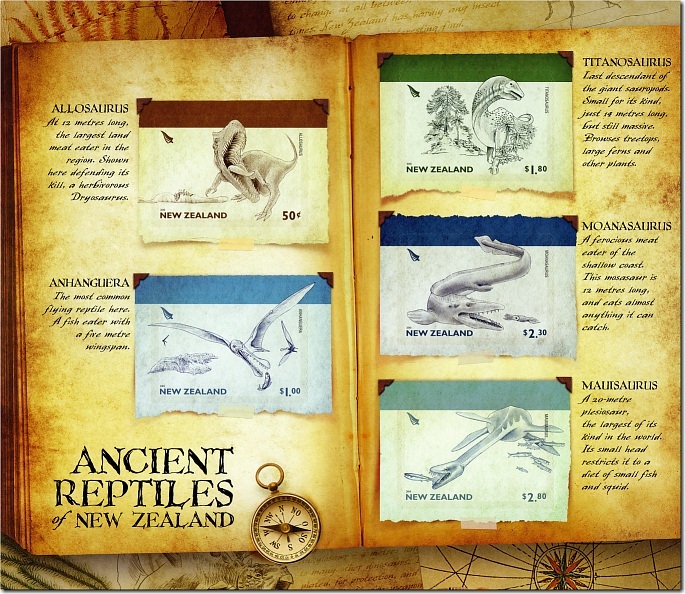 These species disappeared 65 million years ago, but with a little help from New Zealand Post, you can see what it might have been like to meet them face to face. A hundred million years ago, our land formed the eastern margin of the southern super-continent of Gondwanaland. 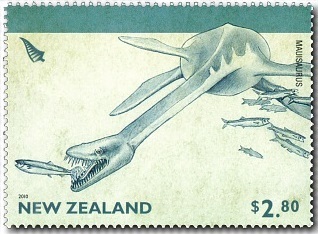 Separated by ocean, ‘Zealandia’ had its own group of dinosaurs, pterosaurs (flying reptiles) and giant marine reptiles that thrived here for 20 million years. The Ancient Reptiles of New Zealand stamp and coin issue explores the behaviour and habitats of this exceptional group of animals as if an explorer has travelled back in time and observed them directly. 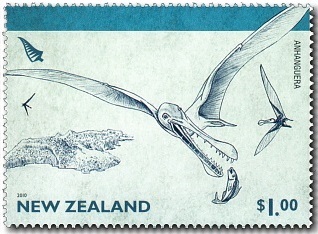 Illustrations on the stamps and coins are ‘field sketches’ – reconstructions based on the most up-to-date information on animal behaviour, ecology and New Zealand palaeontology. At 12 metres long, Allosaurus was the largest meat eater on land in the region. It was at the top of the food chain and, it has been suggested, had a cooperative social behaviour, hunting in packs, much like lions do today. It was able to open its jaws extremely widely, allowing it to attack large prey. hatching, suggesting that they could fly from birth. Titanosaurus was the last descendant of the giant sauropods. It was small for a member of this group of dinosaurs, just 14 metres long, but was still massive and weighed about 13 tonnes. It was tall enough to browse the treetops and large ferns, travelling as part of an extensive herd to protect itself from predators. 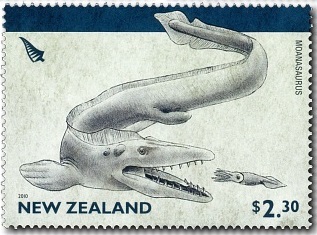 The mosasaurs (including Moanasaurus) were the top predators of the shallow coasts of Zealandia. At 12 metres long, with a 78-centimetre long skull, Moanasaurus would have been a fearsome predator, undulating its snake-like body through the water a little like a crocodile with paddled feet. Although mosasaurs were widespread across the world, Moanasaurus was specific to this region. Mauisaurus was a 20-metre marine reptile (plesiosaur), the largest of its kind in the world. It was an ‘elasmosaur’, the type of plesiosaur with a tiny head and very long neck. This meant that, for all its size, its diet was restricted to small fish and squid in the shallow coastal waters in which it lived. 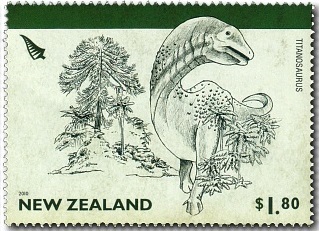 The stamps were also issued in a self-adhesive format on the miniature sheet shown above and a Silver Bullion coin set. 50c, $1.00, $1.80, $2.30, $2.80. Eklektus Inc., Wellington, New Zealand. Southern Colour Print, Dunedin, New Zealand by offset lithography. Four process colours (plus red phosphor tagging on miniature sheet). Tullis Russell 104gsm red phosphor gummed stamp paper. 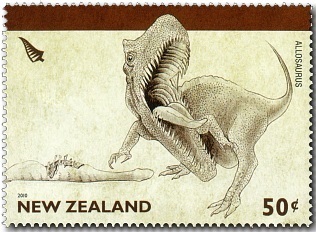 Unless stocks are exhausted earlier, these stamps will remain on sale until close of business 2 March 2011. 2005 - 2009 Stamp Exhibitions. 1984 - 1986 Vintage Transport.